Most interviews are done by phone or such like, and the interviewee has little time to think in depth about each question. 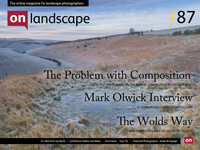 I chose to interview Mark Olwick by e-mail, over a number of weeks, while he was travelling, giving him the time to offer us some considered thoughts about his work and what informs his vision. Mark is based in Seattle, Washington. His work is richly emotive and highly creative. He brings to the landscape a vision and a quality which is immensely personal, and which Mark describes as, 'an attempt to capture the dream of a place'. I find his engaged relationship with the landscape most interesting. SC: Mark, who are you, as a person and as a photographer? Who is the person that makes you the photographer you are? I grew up in Toledo, Ohio (U.S.), which is a very industrial town closely tied to the Detroit auto industry. Lots of good, hard working people there. The definition of a vacation in my childhood was taking a trip to a nearby lake for some fishing and camping. The parents of my best friend growing up though, had a collection of National Geographic magazines and I used to spend hours looking at all of the exotic places around the world, trying to comprehend the vast differences between that and the blue-collar town I was in. I remember laying on the floor of our living room and looking at maps, wondering what those dots and squiggles would look like in real-life. That dream of travel and of exotic places is what drives my photography today. I don't want to capture the literal interpretation of a place, there are already millions of photographs that do that very well, I want to capture the dream. For me, translating a dream into a tangible photograph is both challenging and elusive. I enjoy the challenge, and the creative stimulation it provides. That's what drives my photography. My happiest times are when I'm dreaming of my next trip, so I try to capture that in my photographs. SC: Some artists refer to their photography as a way of, 'reordering their world’. I suppose this can mean different things, but to me it can mean they are simplifying, clarifying and defining the vision and values of a world they inhabit, or would prefer to inhabit. Is your ‘capturing the dream’, a need to escape, to be in a different place? Or is it a passion for expressing the differences between one world and another? What does 'capturing the dream' mean to you and how does that inform your photography? MO: There are a number of aspects to that dream that I explore with my photography. First, it's the anticipation of experiencing another part of the world, another culture, different foods, etc. That's almost as good as being there, and that phase usually lasts longer than the travel itself. Along with the anticipation, you build up a mental image of what it's going to be like. I want to take that mental image and turn it into something tangible. At first, I thought it was a very personal vision that only I would understand, but what I found was that many people can relate to that same image. There are some common metaphors that seem to translate well, no matter what your own personal background. It's not an escape, precisely. When I dove into my desire to travel more deeply, I thought about the concept of "home" and the quest for it. Perhaps that's what motivates me to constantly seek new places. My upcoming book, "Speak to me of home", explores this journey as well as the many definitions of that word. Is home a physical place? Spiritual? Being with someone you love? The dream I referenced is me seeking to define "home" while creating an "ideal" in my mind. SC: I am wondering whether ‘home’ needs to be a physical place or is it a feeling of comfort that can be with you, no matter where you are? It is interesting that your understanding and defining of ‘home’, are guided by your thoughts and experiences of other places. Do you think it helps to be away from home to understand what home is really about? MO: Home absolutely does not need to be a physical place, in fact that's what the book explores - all of the many interpretations of that word. I've come to a conclusion of what it means for me, but I realized that it's an intensely personal thing, and one of the most basic. I do think that being away from home helps in many ways, not just in defining home. As Saint Augustine of Hippo said, "The world is a book and those who do not travel read only one page”. SC: The first Mark Olwick photograph I saw was ‘Lavender’. This was very early in my own journey into photography. In fact, it was one of the first 'Art Landscape' photographs I had ever seen. It was a revelation to me. It immediately took me away from the everyday 'point & shoot’ record style of photography, to a world of creativity, feelings and interpretation. It was the first time I had noticed that a photographer or their vision, was truly present in a photograph. It is a landscape dreamscape. Can you tell me about your relationship with this photograph? MO: Thanks for the kind words about the photo. I did visualize this photo, but only in the moment - it wasn't pre-planned. If I told you were this photo was taken, you'd be surprised. It wasn't in some vast field of lavender, it was in a distinctly urban environment near where I live in Seattle. I wanted the lens flare and through many years of practice I can almost predict how it will look when I shoot with the Holga. I wanted to capture the "feeling" of Spring and not just the literal interpretation, just like my "dream of travel" photography. I absolutely can't stand taking the same photo that has been shot a million times already. I can find many thousands of photos of lavender on Flickr, but none like this. This need to be unique is inherent in my enjoyment of photography and my desire to create photographs. It's also why my output is so limited ever year. That's a tradeoff that I accept though. Capturing emotions and dreams is much more challenging, and fun. SC: ‘Three Elephants’ is another photograph I particularly enjoy. I can’t help but think it is the sky, as a metaphor for our world, that is the true hero here. That the elephants, as large and as strong as they are, are at the mercy of a world that is even bigger and stronger than they are. It will be humans and our civilisation which will decide any future the elephants will have. But perhaps this is just my own interpretation. Can you share with us your thoughts about this photograph? MO: I love your interpretation! It wasn't my goal, but I love that you got that from the photo. To me, this photo embodies my photographic style, voice and technique more than any other. Frankly, it's my favourite photograph. I had been dreaming of Africa since I was a child, and I always envisioned families of elephants moving across a vast, open area, unencumbered by Man. In my mind, I was able to capture that internal vision that had been with me since I was young and turn it into something tangible. The skies of Botswana were amazing, as were the vast herds of elephants, but it was this one family (and it clearly felt like a family) that captured the aesthetic perfectly. When I look at this photo it takes me back to both the dream of my childhood as well as the sights and sounds of Africa, and that's the magic of photography. It can transcend the literal and becomes something ethereal - almost spiritual. MO: I'd say that the majority of my work, maybe 80%, is done as a series, but sometimes that series appears organically. My most recent series, for example, started as an exploration of "why" I love to travel so much. Lots of internal reflection and self-analysis before a single shutter was clicked. I came up with a few core photographs in my mind that would express that visually, and then added to the series as I traveled. Similarly, when I traveled to Africa I had a series of core photographs in mind based on those childhood dreams, but was open to any opportunity that the light presented. It's always about the light. You're correct in that it allows me to go in-depth on a particular subject. This allows me to stay in a creative zone. If I try to read multiple books at one time, it's not the same experience as if I lose myself entirely in one book. From a approach perspective, I follow the great advice from Freeman Patterson (author of the classic "Photography and the Art of Seeing"): Every element in the frame either adds to or detracts from the photograph. Remove the things that detract when you compose. What attracted me to the scene in the first place? How do I emphasize the quality that made it unique? SC: I feel you curate your work carefully, showing smaller numbers of photographs as if they are meticulously considered. ( Much fewer images than most other photographers I know. ) Can you share your thoughts on your editing selection process; what images go in, what gets cut and why. It’s your thinking of 'the why’, that i’m most curious about. MO: Editing is pure hell, and I hate the process. It drains me emotionally, reduces my self-esteem and makes me question everything about my photography. But it's necessary, and in the end, it's worth it. After doing an initial edit based on drafts, I'll print out the photos and hang them on my wall. I need to live with them for a while to remove some of the emotion surrounding the making of the photo and concentrate on the final photo itself as an object. It's too easy to fall in love with a photo because you remember how hard it was to make, and lose sight of what it is as a photo. If I can't imagine someone having that photo on their wall at home for a long time, then it doesn't make the cut. I wish I had a higher output, I really do, but I need to be completely happy with the end result or it doesn't see the light of day. SC: Over time we grow as photographers and as people. I like to think that such growth and learning helps us to make better photographs. What has been the most significant learnings or growth events in your life ( as a photographer or as a person), and how have these helped your photography. MO: I think photography is a reflection of who we are as people, and as we mature our perspectives change. Part of that is self-reflection and part of it is advice from trusted people in your life. I'm lucky enough to have a couple of people in my life who know how to ask the right questions when I show them a new body of work or photo. It won't necessarily change whether or not a photo is successful in my mind, but it may allow me to look at it from a different perspective. Seeing things from a different perspective is what growth is all about, and what travel facilitates like nothing else. One of the best pieces of advice I received about my early photography was "Make me think - don't make it so simple". That had a profound impact on my photography and caused me to go from taking photos to making them. SC: I feel that a lot of contemporary art photography has a reality driven, 'matter-of-fact' tone to it. It is as if emotion and beauty has been purposefully stripped away, to leave a flat frame-worked shell. Your own work is very emotive and retains great beauty, but not in a kitsch way. It is mindful, intellectual and thought provoking and yet can still offer us great beauty. What are your thoughts on this observation? MO: My first thought is to say thank you for saying that. People have different goals for their photography, and I don't think there's any one "proper" approach. I see many landscape photographers who are master technicians - their photos are perfectly exposed, perfectly processed, not a blade of grass out of place. I suspect that's how they get enjoyment from their craft and I have no problem with that whatsoever. I've always been an introvert and an emotional, mindful guy, so that shows in my photography. I think life is a miracle and the fact that I get to travel so much is a dream come true. Sharing that dream is a reflection of who I am and, as an introvert, it's an extroverted way of showing the "real me”. SC: Thank you for your time Mark.